Essential for any modder. Download HERE. Made by Olaf Van Der Spek. Contains: XCC AV Player, XCC Editor, XCC Mixer (V 1.45), XCC MIX Editor and XCC TMP Editor. XCC TFD Shortcut installer - Handy for TFD users. XCC AUD writer - This is a plug-in for WinAmp that allows you to create .aud files from .mp3 files. For WinAmp, and MP3 editing, see Sound related tools below. XCC .dll pack - You might need these DLL files to run the XCC utilities. Put them in the same directory as the program you are having trouble running. DCoders AI Editor - A program to help you edit the AI.ini file. Most use notepad for editing the ini files, but some use other notepad-based programs. These are some good programs to edit the .ini files. Voxel Section Editor III (VXLSE) - A program for editing .vxl files. Cube Normalizer 1.5 - A program for normalizing voxels. WILL'S Voxel Editor. An alternate voxel editor (as used by Mig Eater). 3DS2VXL - A program for converting .3ds files to.vxl files. OS HVA Builder 2.1 - A program for editing .hva files. OS HVA Builder Quick Patch - Updates OS HVA Builder from V2.0 or above to 2.12. OS Voxel Viewer - A program for viewing .vxl files. OS Voxel Viewer Quick Patch - Updates OSVV from V1.5 or above to V1.75. OS SHP Builder 3.36 - A program for editing .shp files. Radar Color Editor Is a program put together by Nyerguds (GUI by IcySon55) which you use to modify the colors of your SHP's on the radar screen, a very handy tool. TMP Shop - A tool to edit many tmp files at once. Among other things, it allows to edit the radar color, terrain type, ramp type and do palette conversions. It's not a tool to draw or create completely new TMP files. For the XCC AUD writer, see the XCC Utilities Section at the top. WinAmp - This program, combined with The XCC AUD writer, can create usable, ready to be inserted into TS, .aud files. Audacity - A program for editing .mp3 and .wav files, which can then be converted to .aud files. Not required, but handy for making many new sounds. Not a requirement of TS editing, but many modders use these programs such as PhotoShop and Paint Shop Pro. Commonly used for creating renders and buildings. Again, not required, but very handy to have. Blender - A free, open source, easy to use 3D modeling program. 3DS MAX - An incredible 3D program. It comes at a price though. For a free trial, follow the link on the main page. See also: 3DS to VXL above. GMAX - A cut down, but free version of 3DS MAX. That site also has tutorials here and there, so make sure you check them out too. Anim8or is a free 3D modeling program which is a favorite out of the free programs. Cinema4D isn't a very popular 3D Modeling program, but it is extremely powerful and very user-friendly (Which Me and Droke personally use). Caligari Truespace is another 3D modeling and rendering program which is for quite a while already for free available. Hex Editing related tools (for editing GAME.exe) Note: These programs are NOT Decompilers/disassemblers. C&C Executable Modifier - A tool that has a collection of hex edits that can be easily applied to different exe files (currently RA2, TS and FinalSun exe). HHD hex editor - A tool for edting the TS game.exe. Note that this is an older version, but it is MUCH better than the new one. Hex Workshop - A more complicated, but more useful Hex editor. PE Explorer - A hex editor and resource viewer in one, with several other useful features. Only recommended for those with experience in exe editing though. Link leads to a download page for a 30 day trial. Resource Hacker - A tool for editing the TS Language.dll. Can also be used to edit the GAME.exe to a certain extent. Explosion Generator - Found by Triforce a while ago, this is a nice program that generates random explosions, which can be used in TS. Neat. Here is my Addendum to the list. Aro, I suggest to add Anim8or to your list of 3D Image SW because it's free and I think it's easy to handle. It gives you all the tools and goodies to cretae great art work. Otherwise good job with your list. Posted: Wed Jul 23, 2008 12:23 pm Post subject: Object not found! your doing a great job aro better than any thing classy or banshee have done recently im supprised youve not got more power. Some of the links may be bugged. I'll go over them another time and fix them up, maybe add some more up-to-date and recent tools. Oh, and thank you. Thank you for your addition to the list, I'll edit it into my post later. About videos, if I want make a video for TS is there any tool ? To convert the video into vqa you can use XCC Mixer iirc. To create the video itself is up to you if you use 3dsmax and render one or if you use one of the various video editing tools. 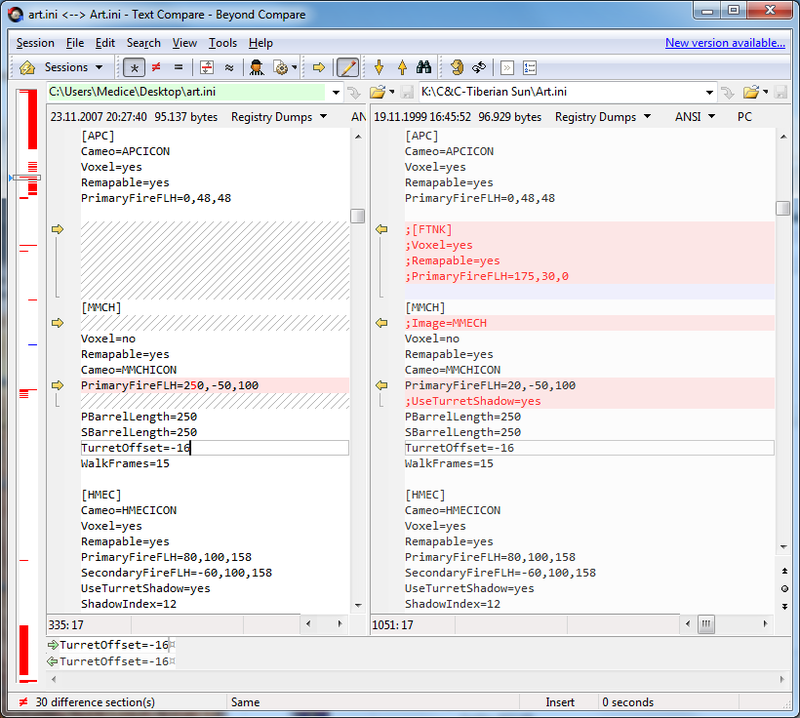 I could not run the XCC Mixer (visual styles version) without the DLL files I attached, maybe the pack should be added. It contains libpng13.dll (PNG support), jpeg62.dll (JPEG support), libbz2.dll (???) and zlib1.dll (no idea why zlib.dll wasn't enough). I think the last two might be related to PNG, since PNG makes use of ZLIB. is it easier if i edit my AI.ini with notepad? It's personal preference, really. I prefer using Notepad for everything, but some like tools that make things easier, and help find errors. the one to TMP editor is dead somebody know where i can find it now? This program will make TS mods using a custom EXE file run on The First Decade. Drop the file you want to patch on the ts_modfix.exe program to patch it. This can be useful for users of TS Freeware version,trying to play old mods that ask for cd. Can anyone upload the "TMP Studio" please? TMP Studio is no longer being distributed because the author no longer authorizes its distribution. If anyone needs TMP Studio send me a PM. You can change the pallet in XCC TMP Editor by going to palet > load. The pal file need to be in the same format that the games uses & not the MS or PSP versions. Oh lol, thanks Aro, can't do cliffs without that. Since it's already a bump, might as well add these. THe AI editor interests me the most. Application failed to start because its side-by-side configeration was incorrect. I read the readme and theres nothing I can see that says about this, anyone know what to do !! I'd like to request if a leet haxor could make a C&C tools bundle for the community. It would be really nice to have an organized, complete assembly of the latest and greatest C&C tools. At the very least, combining shp builder, VXLSE, and HVA builder, since they all share many similar files.